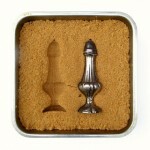 Did you ever make “sand candles” as a kid? The idea was to press objects into wet sand and then pour melted wax into the resulting depression. Once cool, you wound up with a (somewhat sandy) molded candle. Daring Baker Duluth decided to try the same idea with chocolate, using an edible substrate as the mold. The first attempt used brown sugar and she eventually tested several other substances as well; apparently flour works the best. This is a splendid idea, and opens up all sorts of decorative possibilities. Anything small-ish without too much intricate detail is fair game for this kind of casting, and there are plenty of spooky items that would be perfect. Cast plastic novelties like bats, snakes, toads, or spiders to decorate a “witches’ brew” cake, or give a friend a box of chocolate skulls. Cast your own fingers as cake toppers or make little candy tombstones as placecards. This is also a fun and not-too-messy activity to do with kids, so they can make their own edible decorations. Great stuff. I quite like someone’s suggestion on that site of casting fossils. That would look wicked. Tarantulas have fur. That’s all I’m saying. Tarantulas have fur. Brown sugar fur. That’s all I’ve got to say. And apparently I’m incapable of saying anything else. Sorry about the double post.